A playful new adaptation of Jane Austen's beloved novel follows the fortunes (and misfortunes) of the Dashwood sisters — sensible Elinor and hypersensitive Marianne — after their father's sudden death leaves them financially destitute and socially vulnerable. Set in gossipy late 18th-century England, with a fresh female voice, the play is full of humor, emotional depth, and bold theatricality. "Sense and Sensibility" examines our reactions, both reasonable and ridiculous, to societal pressures. When reputation is everything, how do you follow your heart? 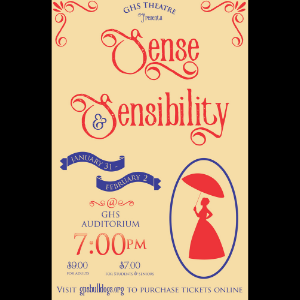 Note: Thursday night's performance of "Sense and Sensibility" was canceled due to inclement weather, but a new show has been scheduled for Sunday, Feb. 3, at 1 p.m. Thursday's guests may join us Sunday — tickets for the Thursday show will automatically transfer to Sunday. However, if Thursday's guests would rather attend a performance on Friday or Saturday evening, they may bring their tickets to the box office on those nights and our staff will switch them out.